There is beauty in almost everything. 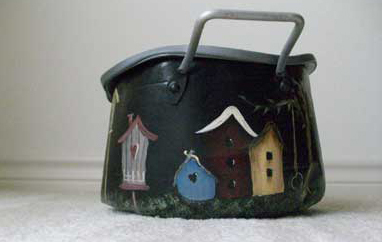 When I found this old bent and broken pan, I thought this pan probably has cooked many a fine meal. What can I do to re-establish it and make it into something useful again? Since I love to paint, naturally painting something on it came quickly to mind. 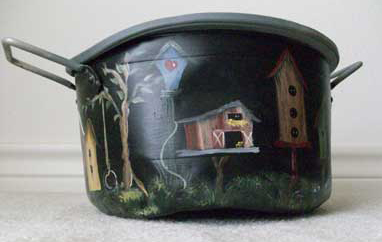 And since I love to paint birdhouses it seemed to be the perfect match. So, birdhouses it is. 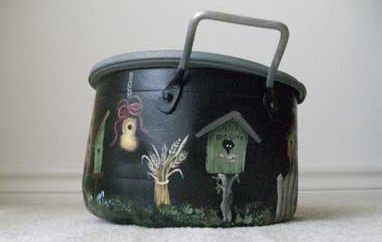 I have painted them on many different surfaces, but on an old pan is a first. I had no idea what to do with it when it was finished. It ended up being used in my kitchen pantry to hold small packaged items such as ranch dressing, onion soup, etc. It found a happy home at last. Most of the birdhouse patterns were designed by Jamie Mills-Price. The others just popped into my head (I’m sure you can tell the difference). Till next time, thanks’ for stopping by! 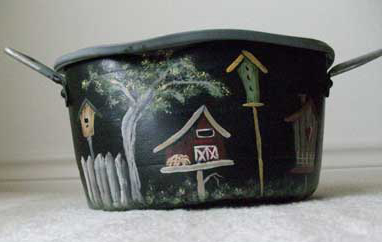 This entry was posted in Crafting & Painting, Misc painted crafts and tagged birdhouse patterns, birdhouses, birdnest, country crafts, crafts, hand painted, kitchen pantry, painting, pan, saltbox house on Tuesday, May 1, 2012 by Betty.